Every closet needs a revamp from time to time. With spring weather on its way, now's a perfect time to start a refresh. Cleaning out and organizing your closet helps you take inventory of everything you have, so you can evaluate which clothes and accessories you’d like to keep and which have overstayed their welcome. Spring is upon us, which means fresh flowers and brunches on the patio. It also means it’s time for spring fashion. Fun florals, easy-breezy fabrics, and bright pops of color are all welcome. That said, it can sometimes be difficult to transition from winter fashion to spring fashion. After all those months wearing neutrals or darker colors, how can a fashionista stay on top of the new spring trends? We’re long past the elegant days when ladies wear gloves and hats and men wear suits to travel. That said, we can all agree that looking out best is always in style and wearing stylish clothing has actually been proven to positively affect your mood and personality. Here is our round-up of the top 5 spring 2019 nail colors and designs - just in time! Diamonds are forever, and so are these seven jewelry pieces every woman should have in her jewelry box. This year's accessory trends are bringing back some of the classics. Start curating your collection of jewelry essentials that will never go out of style. With Valentine’s Day right around the corner, you're likely pondering gift ideas for your sweetheart. If it feels impossible to find something truly unique, remember that in the end, it's a day that represents your love for one another. Consider stepping out the box of heart-shaped chocolates and a dozen roses. Plan an experience for your partner rather than purchasing a gift or if you’d like to give something material, shop online to find unique gifts. If you're in the need for some inspiration, look no further than this Valentine's Day gift-giving guide! You’ve survived the holidays and 2019 is finally here. We wanted to showcase the top jewelry trends to look out for with the new year so we put together a list just for you! These modern and chic earrings are a MUST for the new year. Made famous by Kristin Cavallari’s new fashion line, Uncommon James, and new E! hit reality show, Very Cavallari, this earring style is perfect for the effortless style. Fashion Expert Stefanie From Style Truly Shares Her Holiday Fashion Picks! Winter Wardrobe and Jewelry Trends From Blogger Lauren Imbriaco! Are you a busy millennial in desperate need of some clean eating hacks? Clean eating--or any sort of diet, for that matter--can be especially hard when you are busy. I know this all too well! Millennials are no stranger to the side hustle; we are often balancing day jobs, passion projects, and busy social calendars, all at the same time, making our lives a little crazy. Still, that’s no excuse to be dipping into the McDonalds drive-through in a fit of hunger. I am going to share the best five clean eating hacks for busy millennials. These hacks are guaranteed to keep you clean, even on the busiest weeks! Adventure seeking and life-liver, those words sum up Maddy Crayy's blog and Instagram page very well! When the Glamour Jewelry Box team came across her photos we knew she loved to have fun while looking stylish and trendy! We wanted to introduce an Austin-based fashion blogger that focuses on fresh classy looks by mixing high and low pieces that anyone can wear. Meet Stacie from Sophisticated & Styled. Top 5 Instagram Accounts to Follow To Get Some Jewelry Inspo! Instagram is one of the most perfect places to find blogger accounts focused on awesome fashion looks and styles. So much so that they give us inspiration on what to style and wear with each posted picture and Instastory video. 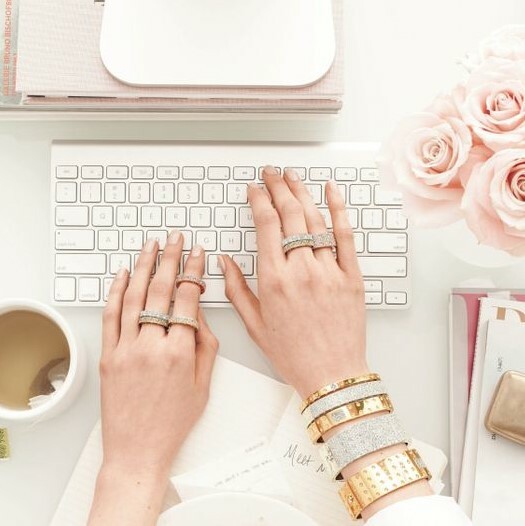 We scoured the Instagram land to find you the top 5 emerging Instagram blogger accounts to follow that will help you improve your fashion and jewelry game! If you landed on this post you may be wondering, what is jade rolling? After seeing this tool on Dr. Oz I searched the internet to find out how to use a jade roller, what kind of before and after results I might get and any reviews I could find. I came across so many articles that shared the history of this beauty tool. Summer is all about the sun, great weather, and getting invited to a lot of fun weddings! With that being said, it's wedding season time and we want to make sure you have the right accessories to look fabulous while having a blast during these summer weddings! We put together the top jewelry trends for this summer as a wedding guest! I’m sure your mom has a special place in your heart. She’s been apart of your highs and lows and has seen you grow. With Mother’s Day fast approaching, why not plan and dedicate this day to show her your love and appreciation! We put together a guide to help you plan something spectacular for your mother! Join now to become a Glamour Jewelry Box member with 3 jewelry pieces delivered to your door every month! Provide your email for the latest news, updates, and special discount codes!